Ideal for sun damaged skin, or skin with pigmentation, this cream helps to reconstruct the skin and limit scaring or hyperpigmentation. It also has antibacterial agents such as copper and zinc that help to purify the epidermis and soothe irritated skin due to the active incredient of Antalgicine. The product is fragrance free and water resistant. This repairing cream saved my life,My skin was damaged in such a way that was killing my self esteem.I could not go out, i could not even wear short sleeved clothes.from face to toe it was that bad. One day i was sopping for my little girl at clicks i saw this bioderma products and i decided to try it. Yhoo results were noticeable in just 5 days.Its been 2 months now using it my skin is all clear as you can see on my profile pic.I will never forget what BIODERMA CICABIO REPAIR CREAM did for me. I have to let you in on a little secret. This is a miracle cure for abraded skin. My beautician recommended this little nugget to me before I went on my trip to Thailand and thank the good Lord that I listened. I applied this every night (on my whole body) after a day out in the sun and it healed me right up. Don’t mistake me, it doesn’t prevent sun burn but if your skin sizzles in the sun then this miracle cream soothes and heals your skin faster than anything else I have ever tried. It’s new on the market and is safe for the whole family to use. 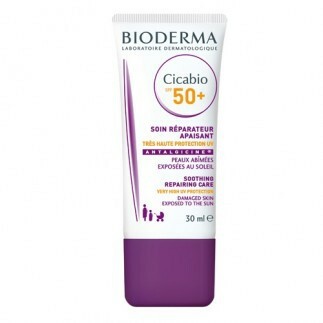 The Cicabio range is formulated fir damaged/irritated skin and this particular moisturiser has a built in 50+ SPF. It’s a 2 in 1 treatment as it repairs and protects damaged skin against sun to limit scarring. It restores the epidermis of the skin as well as limits the risk of brown spots. Beware though, this product is highly hydrated and can leave your skin looking oily. But trust me, its worth it. It’s fragrance free, waterproof and hypoallergenic. Score! A 30ml bottle retails for about R199. A must if you are constantly in the sun! I love how light this cream feels on my skin. Packed with nutrients, an SPF and anti-bacterial properties, you would expect this product to appear cakey on the skin. On the contrary, this product was fast absorbing and fragrance free- so much so that you forget it is even on. I apply this every morning underneath my makeup - to prepare my skin for any sun exposure that might occur and to treat any areas of irritation throughout the day. Its a great primer that smoothes out my skins complexion and allows makeup to stick to the surface of the skin. This can however also be used on parts of the body that have experienced damage - the properties in the cream heal the skin, reduce inflammation, disinfect the area and promote cell repair. It really does do it all!